I want this house. Isn't it pretty?! It's for sale. It could be mine. Marcus gets a raise, tripling his salary. I think they should triple fire fighters' salaries. If that counts for anything. This is the kind of house I could live in forever. I can just picture Katie growing up here. I can picture having tons of parties and get togethers. 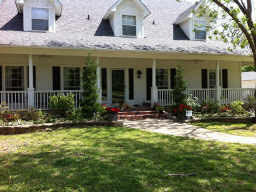 (the good wholesome kind, not the kegger kind) I picture Christmas garland on the columns and pumpkins on the porch. Not at the same time of course. Then when Marcus and I are old and gray...well, grayer, Katie will come over with her cute husband and kids to visit us. It won't be a long trip for them, since they will live next door! I don't need this house. We have shelter, but I want it. I have already talked to God about it. I think it's perfect for traveling ...which I will be doing soon. And just for everyday use too. I love that you can wipe it off. And I love that it can hold lots of crapola, because if you have a baby, you have crapola. It would be way more stylish then carrying around a diaper bag too. Is it possible that this could fall under the need category? In comparison to the house, it's a bargain! I am so thankful that God does provide all that I need + a million times more. I am also thankful that he gave me the freedom, and the imagination, to hope and wish and dream for things too. AND I am fully aware that if I don't get what I want, it means He has a better plan for me! Great post!!! He is so good and is our Provider...I love Him so. Everything good comes from Him. That house is adorable and I definitely agree firefighters need a raise! 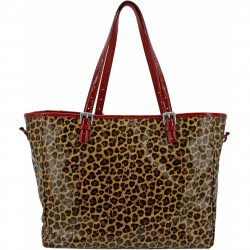 Cute bag as well...but I'm not surprised as you have FABULOUS taste! It IS exciting that His plan is ALWAYS better! I too vote that firefighters should get a raise for a couple of reasons: they work hard to keep us safe, they look so cute in their uniforms :) and because I would love for you to be able to get that house. I want to see you decorate another house! Love your style! You crack me up! You should write a book and then you'll make quadruple the salary of a firefighter. I'm the same way when it comes to handbags, and flip flops for that matter. There's nothing wrong with a dream as long as it doesn't make you blind to what you have. Love that you're blogging everyday this month...your posts are hysterical! Amen! And firefighters and teachers should be paid more!!!! You crack me up! All I do is laugh when you write. Thank you for sharing and being real!